(EMU) – St. Kitts, March 18, 2019:The Ministry of Education officially welcomes, Dr. Jacqueline Austin as the new President of the Clarence Fitzroy Bryant College. Dr. Foster is regarded as an extraordinarily effective consultant, planner and advocate for higher education, who has worked with the Caribbean Development Bank and the European Union. A graduate of the University of Leicester and the University of Manchester, Dr. Austin was the former Director of the Barbados Community College. 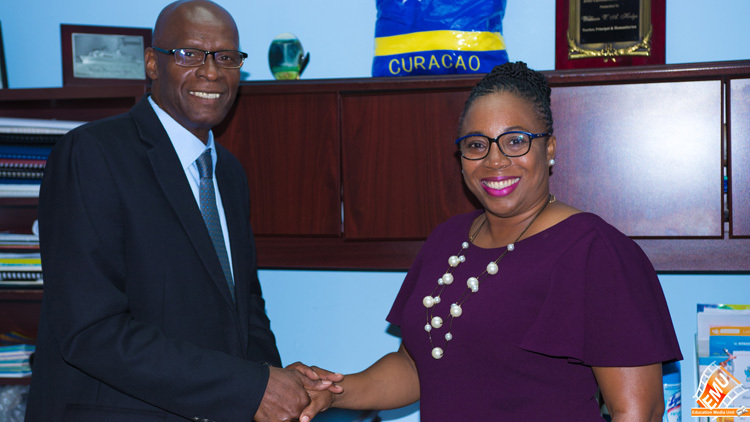 As a leader in higher learning, the Barbados national most recently served as a consultant to the Caribbean Development Bank, working across the region on Technical and Vocational Education and Training (TVET) focused initiatives. During an interviewwith the Education Media Unit on Monday 18th March, Dr. Austin said that she was attracted to the CFB College because of its engagement of students and the chance to influence policies and processes for their development. “If our human resource is indeed our greatest resource, we need to be practical on the ground implementation. I was prompted to apply for this role as president because I saw CFBC as one of the institutions implementing TVET at that grass-root level and I wanted to be involved in that practical component,” she declared. Dr. Austin who officially took office on Monday 11thMarch; she succeeded past interim President, Mrs. Ionie Liburd Willett. She has already paid courtesy calls on the Minister of Education Hon, Shawn Richards and the Permanent Secretary in Education Vincent Hodge.